The Brandon Browner signing is official, and the Seahawks signed four of their own free agents. 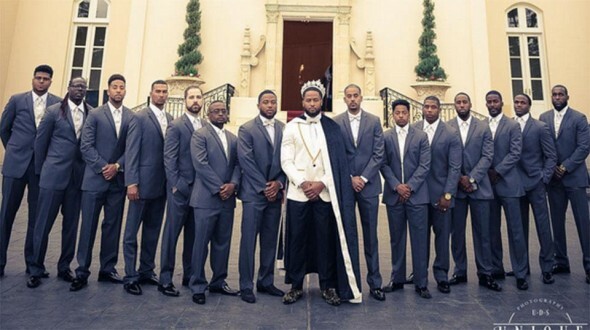 And Earl Thomas took a helluva photo at his wedding over the weekend in Houston. CB Brandon Browner, an original member of the Legion of Boom, officially signed a one-year contract with the Seahawks Monday, a day after agreeing to terms. The Seahawks also signed restricted free-agent C Patrick Lewis and exclusive-rights free agents TE Cooper Helfet, CB Mohammad Seisay and S Steven Terrell. Details about Browner’s deal have yet to be reported. When he was released by the New Orleans Saints in March, Brown was one year into a three-year contract worth $7.75 million, with a 2016 base of $2.75 million. Browner will be 32 in August and is unlikely to receive much in the way of guaranteed money. Earlier in the offseason, the Seahawks signed CB Jeremy Lane to a four-year deal worth up to $23 million to fill the spot opposite Richard Sherman. Browner could be a backup at corner or slot, and at 6-foot-4 and 220 pounds, also could play in running downs. Lewis, who came to the Seahawks in 2014 via their practice squad, did not play in Seattle’s first four games last season, but made nine starts thereafter. He reportedly agreed to a $1.671 million tender. Helfet appeared in 13 games last year with two starts. He caught 13 passes for 130 yards and no touchdowns. He also played in Seattle’s playoff games at Minnesota and Carolina. Seisay spent last season on injured reserve and Terrell saw action in 12 contests on special teams. Over the weekend, FS Earl Thomas married his high school sweetheart, Nina, in Houston, an elaborate affair that included the groom wearing a crown and cape, for reasons that remain unclear. Thomas proposed last summer in Orange, TX., the couple’s hometown. They have a child, Kaeleigh Rose. SS Kam Chancellor was in the wedding party. For more photos and details, see seahawks.com. Mar 9 Alvin Bailey G 585K Received no offer; signed with CLE. March 15: Released long snapper Clint Gresham, who had been with the Seahawks since 2010. Gresham signed a three-year, $2.7 million contract extension a year ago and his release will save $660,000 against the cap in 2016. With Lane, Simon and Shead on the roster Browner isn’t a lock to make the team. If the Hawks opt for a DB with their first pick, such as Eli Apple of Ohio State (how can you resist someone named Apple playing in Washington state?) or Keanu Neal of Florida he’ll be hard pressed to make the team. IMO, the biggest issue with the defense last season was experienced depth in the LOB. Glad Helfet was re-signed. Graham isn’t a guarantee to be ready in September and Helfet has had some good games for the Hawks. Plus this is a TE weak draft. I’m wondering if they’ll make a decision on Fred Jackson since Rawls is no guarantee to be ready in September as well.